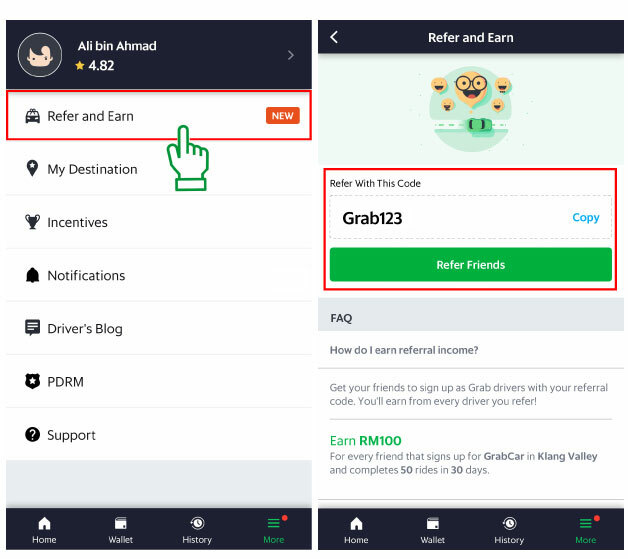 Earn additional income for every person you refer to join Grab as a driver-partner! For every person you refer to Grab, you earn *RM100! Go to ‘More‘ in your Grab Driver App. Click on ‘Refer Friends‘ and you will be directed to a page where you can select the desired social media app to share the details with your friends. Once your friends receive your invitation, they just need to click onto the link in the message. It will lead them to a sign-up page. The more new driver-partners you refer, the more you can earn! See below for the terms and conditions. You get RM100 per successful referral. Refer via the driver app by using your unique referral code. The referred driver-partner must complete 50 jobs within the 1st month upon activation. You must be an ACTIVE driver-partner: maintain at least 7 jobs within the past week, or minimum 5 jobs/week (if you are less than 1 month old driver-partner. So if you joined 2 weeks ago, then you must do at least 10 trips in total within that 2 weeks). Only applicable for driver-partners referred in Klang Valley. Only applicable for Klang Valley driver-partners.